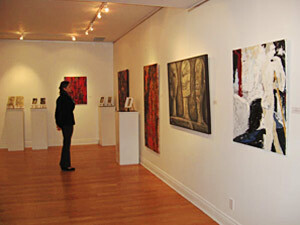 Featuring Toronto-based artists Jeremy Bowes, Susan Dain, Steve Rose and Linda Semple. 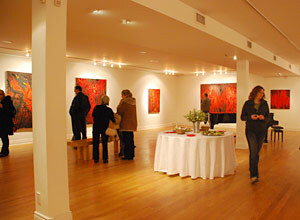 March 1-March 14, 2009, large scale red abstract paintings. 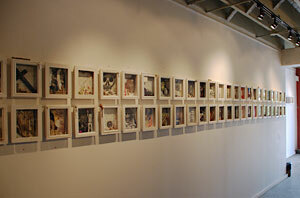 March/April 2009, an exhibition of paintings and assemblages based on experiences from yoga and meditation. September 2007, an exhibition of 100 shadow boxes with a day of the dead theme. 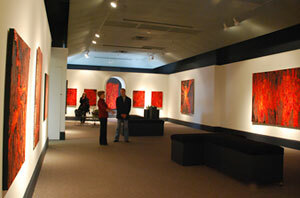 September 2006, an exhibition of large scale red abstract paintings. May 18-June 7, 2003, an exhibition of Romanesque inspired paintings. 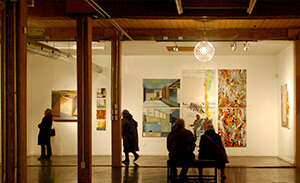 November 4-25, 2001, a ten year retrospective exhibition of drawing, painting, and printmaking. June 11- August 30, 2000, an exhibition of Romanesque inspired paintings.